How proud I am of my thriving tomato plants, the hundreds of yellow blossoms, the tiny green tomatoes with such great potential. 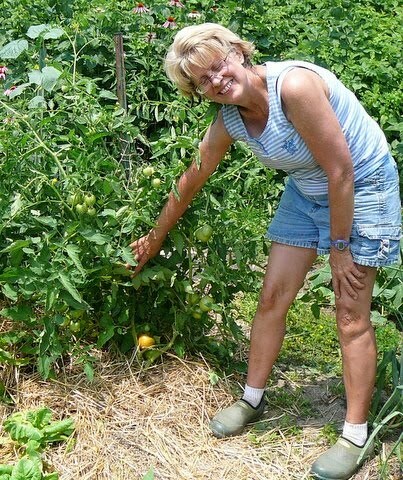 But Barbara White, a Howard County Master Gardner, has Early Girl tomatoes turning from yellow to orange and probably will have picked and eaten one or two by the time I post this blog. Wall-O-Water and similar products are plastic plant protectors consisting of cells that gardeners fill with water. 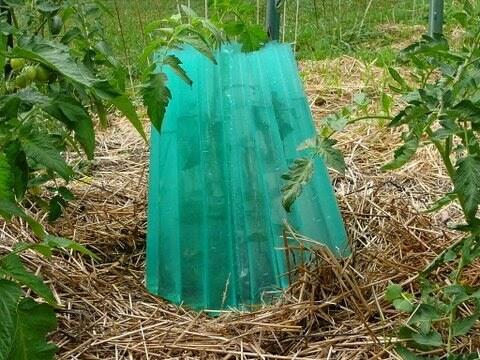 The tepee-like protector covers a diameter of 18” around a plant. The sun warms the water during the day, and the water moderates the cool, nighttime temperatures of early spring, protecting the plant inside. Gardeners often use them to encourage early growth of tomatoes, but they work for other veggies too, such as peppers, squash, and melons. The protectors are made by several manufacturers and come in a variety of colors, such as green and red. Which is better? Thumbs up for Walls-O-Water. Walls-O-Water saved my cherry tomato plant from late frost in May and I have two little Sweet 100 Cherry tomatoes ready to be picked, now. I also planted Early Girl tomato plant in a large clay pot on my brick patio in late April. It survived the same frost from any protection. Lucky me! 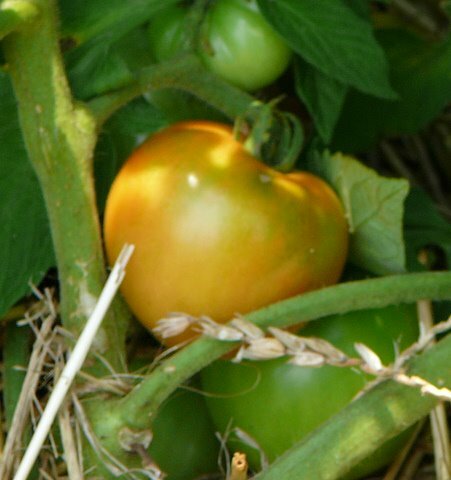 I will pick my first Early Girl tomato fruit today! Both plants grew from seedlings bought at a garden center. I have heard that the frugal gardener can use 2 liter soda bottles filled with water to form a circle around your plants. Obviously, not cheaper if one specifically buys and drinks all that soda just for this, but if one can round up from soda drinking friends and family, it sounds good. Yes, Anonymous, I've seen several suggestions that water-filled soda bottles work too. Hey, if the bottles are green, they'd even have the same heat-gathering equivalent of the green Walls-O-Water. And perhaps liter bottles would retain heat even a tad longer than the smaller Walls-O-Water and help protect plants longer on cold nights.